This fossil is from near my hometown of Barstow, California. 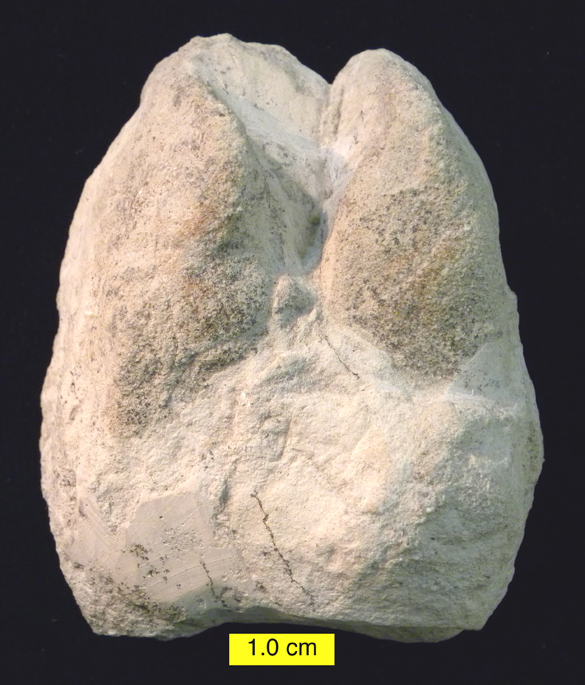 It was collected many years ago loose in talus from the Barstow Formation (Barstovian, Miocene). I note this carefully because today collecting such specimens from the Fossil Beds of the Rainbow Basin Natural Area is illegal, as it should be. This is one of the most fossiliferous Miocene deposits in the world, and it has been heavily vandalized over the years. The Barstow Formation (in a wonderful syncline) at Rainbow Basin, Mojave Desert, California. This two-toed footprint is Lamaichnum alfi Sarjeant and Reynolds, 1999. It is preserved as a convex hyporelief, which is essentially a filling of the actual footprint. It was made by a camel-like animal (there are many choices) that walked through stiff volcanic mud along a stream during the Miocene. The impression of this foot was quickly filled with later sediment, probably from an overbank flood. When I was a kid we found dozens of these footprints in long trackways throughout the Barstow Formation at the Fossil Beds. Those fossils are all gone now, most lost to collectors with rock saws and sledge hammers. Fortunately many have been lovingly preserved in the Raymond M. Alf Museum in Claremont, California. You will note that the ichnospecies of our fossil was named for the charismatic Raymond Alf, a legend in the study of vertebrate trace fossils and a spectacular teacher.